Bright green and super sweet, the appletini is one of those cocktails that's easy to enjoy when you're new to cocktails. 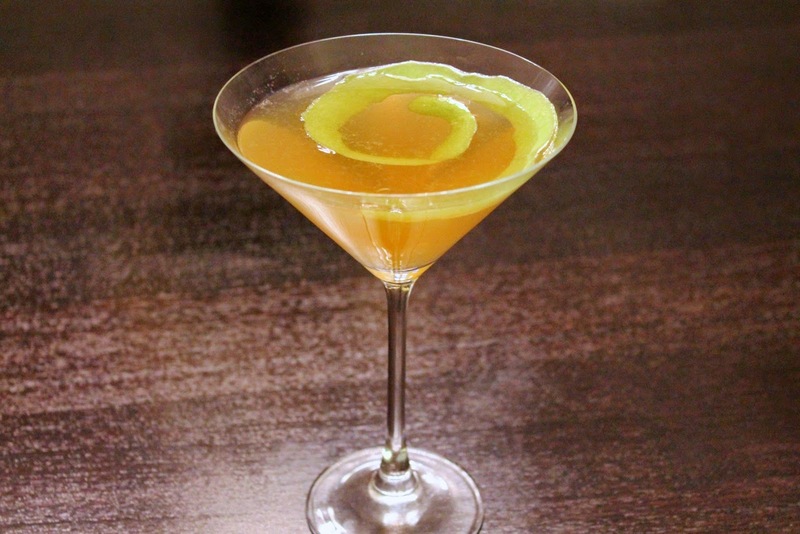 It goes down easy and it's simple to make: the most popular version is simply vodka and sour apple schnapps. I drank a lot of them back in the day, but frankly, they no longer appeal to me. Not to sound too snobby about it, but I like a more refined cocktail--something that isn't so sweet and has more interesting flavors. Yet to forgo the appletini shouldn't mean there aren't plenty of other great ways to use apples in cocktails (see the "related" links below for some great examples). For this drink, I wanted a cocktail that celebrated apples but was more refined than the traditional appletini. Of course, an appletini isn't a real martini in the traditional sense, but we can nudge it a little closer by using gin instead of vodka. I used the Half Moon Orchard Gin that Roofers Union bartender Frank Mills introduced me to when he shared his recipe for the How Do You Like Dem Apples cocktail. The gin is made with apples as produced by Tuthilltown Spirits Farm Distillery in New York. For the apple liqueur, I turned to Leopold Brothers, a Denver-based distillery that makes amazing gin, but also a line of liqueurs. Their New York sour apple liqueur uses a blend of sweet apples like Honeycrisps and sour ones like Granny Smith. For the ginger liqueur, I went with Bloomery SweetShine ginger liqueur from the Bloomery Plantation Distillery in West Virginia (which has, unfortunately, closed). Lastly, the bitters--technically a shrub--also contain apples. It's a celery-apple shrub from Bittermens to round out the drink. For the garnish, I cut a very long apple peel and set it in the glass as a spiral. It doesn't really stick to the side of the glass, but even if it floats it still looks fun. Combine gin, apple liqueur, ginger liqueur, sherry, lemon juice and shrub in a cocktail shaker with ice. Shake until very cold. Place the apple spiral in a chilled cocktail glass. Strain cocktail into the glass.